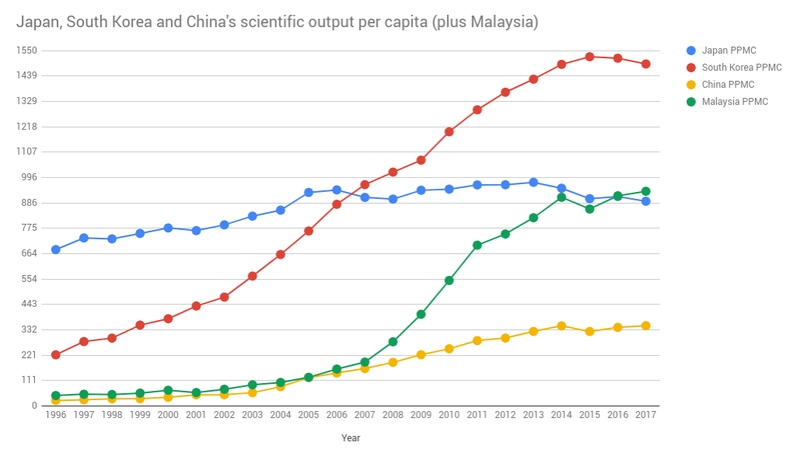 Below is the graph from my previous post where I discovered that Malaysia has been producing more scientific research per citizen than Japan since 2016. This is very interesting because Malaysia is a Muslim-majority country. Japan has stagnated since 2006 due to its aging population and stagnant economy while Malaysia, thanks to having a sustainable population (thanks to sustainable fertility rates, thanks in large part to religious faith) continues to grow steadily. We can expect South Korea to slowly fall as it goes the way of Japan, so that Malaysia may actually become the top science-producing country (per capita) of Asia in the next two decades. In 2017, Japan published 892 scientific papers per million citizens, while Malaysia produced 936. As part of my series of posts comparing the scientific output per capita of different countries, in this post I will compare Japan, South Korea and China’s scientific output per capita, meaning the number of scientific research papers published per million citizens by each country. In the late 1990’s South Korea was going through industrialization but was greatly behind Japan. South Korea’s papers published per million citizens (PPMC) was 222.8 in 1996, compared to Japan’s 681, meaning that Japan was producing almost three times as much scientific research as South Korea. As South Korea industrialized, the gap between the two countries narrowed, so that South Korea actually overtook Japan in 2007. The sad story of Japan is that it has never been able to go significantly above its 2006 scientific output levels of 942 PPMC, perhaps due to its aging population (its median age is higher by 6 years today compared to South Korea’s), and perhaps due to its stagnant economy caused by the long-term effects of interest. South Korea too appears to have entered the twilight zone in 2015 at a PPMC of 1523, we can probably safely assume that it will go through decades of slow decline from here on (unless immigration saves the day). 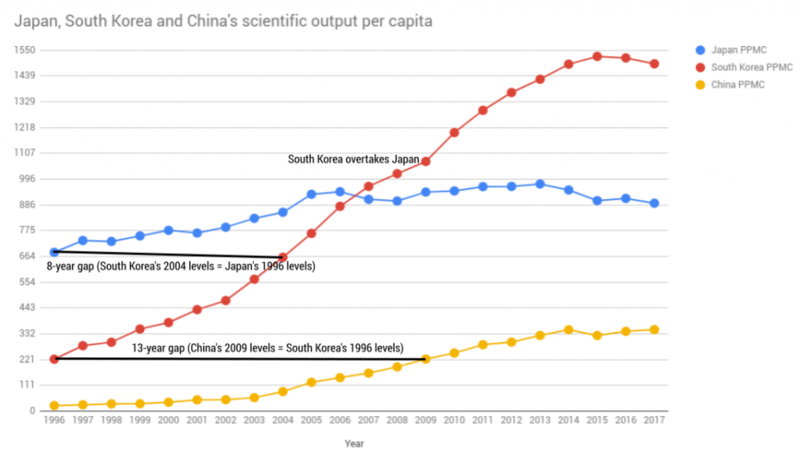 China is slowly ramping up its scientific output, although it has yet to overtake South Korea’s scientific output per capita levels for the year 1999.